Check out this REVIEW of a new crafty novel; not scrapbooking per se, but still sounds very interesting, yeah? At the bottom of the article are 2 links that will tell you about scrapbooking novels. HERE is a link to another scrapbook novel and if you scroll down to the “Customers who bought this item also bought” section, you’ll see tons more. I’m so happy to see the addition of all these scrapbooking novels and mysteries over the years. They combine my 2 favorite hobbies: reading and scrapbooking. In fact, I didn’t realize until I did that search on AMAZON that there were quite so many! but I think that’s it. Crikey! I have some major reading to do! Do you ever read scrapbook-related novels? Why or why not? Which ones have you read, or would like to read? Pink Paislee’s New Scrapbooking Magazine	Scrapbooking T-Shirts at Michaels! I haven’t read any about scrapbooking. But I have read one about quilting and really enjoyed it, it was a mystery. I also read one about a doll maker, it was a love story. Wonder what kind of scrapbook tips and recipes would be included in “Tragic Magic?” Interesting. I have read a few of the sb novels, but cannot remember who the author was. Tragic Magic was REALLY good! I got it right after she released it! I couldn’t stand to wait! LOL! I have Waking Up in the Land of Glitter already on my list for my next trip to the bookstore! I am really looking forward to it! I haven’t read any scrappy novels, but I’ve been tempted too. Especially after reading about them here. LOL! Now if I could just find time to scrap AND read, my world would be perfect! TFS! Try Joanna Campbell Slan–I am eagerly awaiting the third of her scrapping series. I think these are better than Laura Childs. I found a series called “Sisters Ink”. So far I have really enjoyed them. Good stories about sisters who share a love a SBing and the roll it has played in their lives. I just finished reading Joanna Campbell Slan’s first two books and I would have to agree with Jean–these are better than Laura Child’s series. Kiki, the main character, is funny and down-to-earth. I can’t wait for the third one to be available in May. I read the first two of her books on my Kindle app on my iphone. 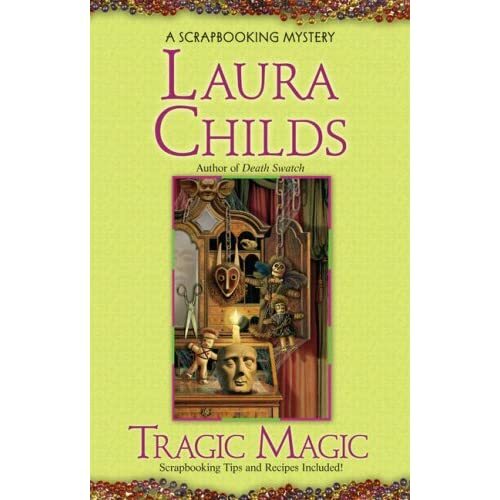 I just downloaded Laura Child’s Tragic Magic to my phone for some weekend reading. I also like Laura Child’s tea shop books!